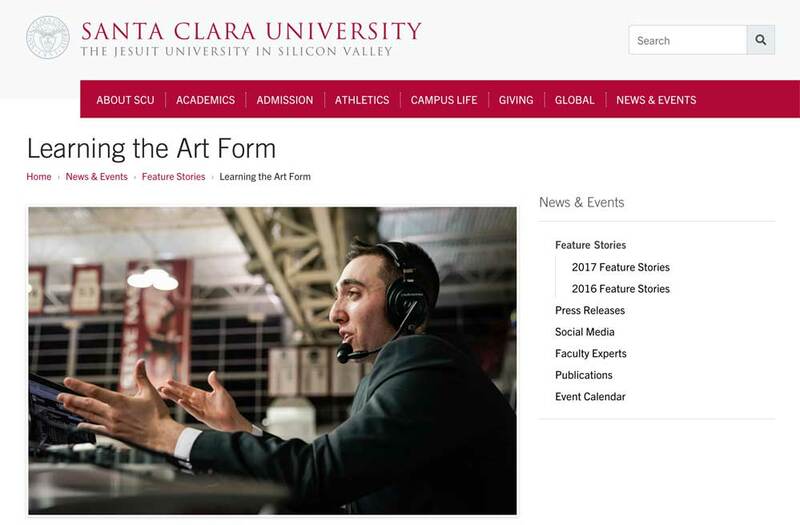 Click on the image above to read a profile of Jack that appeared on the front page of the Santa Clara University website (scu.edu) on September 5, 2018. Jack Benjamin is a play-by-play broadcaster currently based in Charlotte, North Carolina. Jack serves as a play-by-play voice for various Division I Athletic programs including the University of Virginia (UVA), Davidson College, Winthrop University, and the University of South Carolina Upstate (USC Upstate). Jack’s work can be seen through various ESPN online platforms including ESPN3, ACC Network Extra and ESPN+ and can be accessed through the ESPN App. He can also be heard on the Virginia Sports Radio Network. Born and raised in Armonk, New York, Jack grew up an avid Yankees, Knicks and Giants fan. One of the first voices he listened to on the radio was longtime Yankees broadcaster, John Sterling. Mike Breen and Michael Kay, the TV voices of the Knicks and Yankees, respectively, were always playing in the background. Bob Papa was often heard on the radio. Jack headed West for college to Santa Clara University (SCU), a Jesuit school best known for housing future NBA Hall of Famer, Steve Nash, in the late 1990’s. When Jack arrived at Santa Clara in the fall of 2014, the student radio station, KSCU 103.3 FM, did not have students calling games. In fact, students had not broadcasted games in 20 years. After countless phone calls, emails, and meetings, as well as hundreds of “mock broadcasts” into his handheld recorder over the course of two years, Jack finally got the opportunity, on November 11, 2016, to do play-by-play for an SCU Basketball game on KSCU. He then proceeded to broadcast every home game over the course of the season. As a senior, Jack broadcasted all Men’s home games, in addition to a road game at #22 Saint Mary’s and Santa Clara’s first round game at the 2018 West Coast Conference Tournament in Las Vegas. It was KSCU‘s first WCC Tournament broadcast in more than two decades. KSCU also became the first West Coast Conference student radio station to broadcast a game since the tournament relocated to Las Vegas in 2009. During his sophomore and junior summers of college, Jack gained valuable experience working as the voice of two collegiate wood bat league teams. In the summer of 2016, Jack worked as the Play-by-Play Voice and Media Relations Assistant for the Kalamazoo Growlers of the Northwoods League. He continued broadcasting baseball in the summer of 2017, serving as the voice of the Yakima Valley Pippins of the West Coast League. He called all 61 regular season games, three playoff contests and the West Coast League All-Star Game on AM 1460 ESPN Radio – Yakima ‘KUTI’. In addition to working as the team’s play-by-play voice, Jack served as the Pippins’ Media Relations Manager, compiling 15-plus page game notes packets for every game. Jack also handled all team press releases, the Pippins’ website and social media accounts, while also producing and editing two on-camera interviews per game. Over the course of his junior and senior years at Santa Clara, Jack worked as a freelance play-by-play voice across a variety of networks and platforms. Jack’s work included serving as Central Coast Sports‘ play-by-play voice for the West Catholic Athletic League football and basketball “Game of the Week” on AM 1590 KLIV-San Jose. Jack also worked as a play-by-play voice for a variety of high school and junior college sports broadcast on various TV networks including KMVT 15, (simulcast on AT&T U-Verse channel 99, and Comcast channels 15 & 26), CreaTV, (simulcast on Comcast Channel 16 & 28), the NFHS Network and the Bay Area Online Sports Network. For three years, Jack also hosted a weekly sports talk show on KSCU, Overtime, in which he addressed the most pressing topics in sports. Jack’s show featured interviews with a variety of Santa Clara student-athletes and coaches, as well as athletes and personalities within the broader world of sports, including one of his broadcasting idols, Chris Berman, who gave Jack the ‘liner’ to begin his talk show. For his show, Jack also interviewed Fox NFL Rules Analyst, Mike Pereira, and did several interviews with Tom Brady Sr., the father of the New England Patriots five-time Super Bowl winning quarterback. When Super Bowl L was played in the Bay Area in February 2016, Jack attended Super Bowl Opening Night as a credentialed media member, and interviewed members of the NFC Champion Carolina Panthers as well as the Super Bowl Champion Denver Broncos, which he later played on his show. In September 2018, his annual NFL Draft segment was named a finalist for “Best Sportscast” for the yearly CBI Awards.